SciaFobia means fear of shadows and combines two-dimensional abstracted objects and figures that become three-dimensinal in the process of the story. It is inspired by the work of Saul Bass. The animationfilm SciaFobia was specially produced as a fulldome-screening. 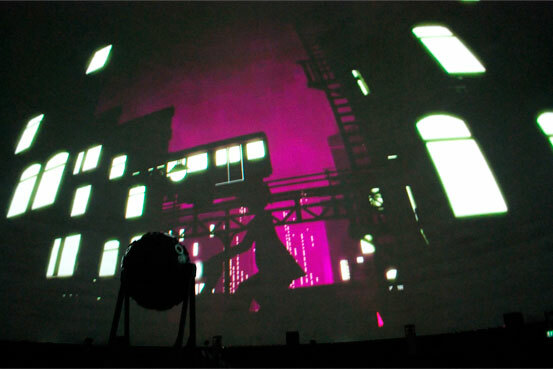 In fulldome-projections the viewer is placed under a dome and is able to watch the Screening in 360°. Our goal was to play with the immersive effect: The dramatugy of our story was concepted in a way that the viewer is lead from a two-dimensional into a three-dimensional world at the end. To even emphasize the three-dimensionality we had a real person acting. In the end when the main protagonist of our story has got his accident, the actor, clothed black, rises and runs trough the audience to finish our concept of the developing three-dimensionality.